Berlin is a beautiful, chilled city. Its Marathon appears to be run by the friendliest people ever – efficient, but human. 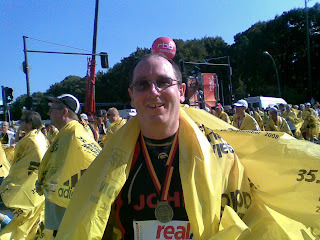 Lots of smiling marshalls, excellent provision of water and the German equivalent of Gatorade. Thousands of bananas, ready peeled and thrust at runners as if we were performing chimps. And lots of very, very cheesy music. The weather couldn’t have been better. Blue skies, but not too hot. I managed to run pretty much the whole way, walking only at the water stops. The difficult kilometres between 22 and 32 weren’t nearly as bad as they have been in the past. The crowds for the last 10k meant you couldn’t possibly stop! And a personal best at 4 hours, 39 minutes. Very satisfactory. hurrah! love from joe, trish, jackpot and the bizarre mother.